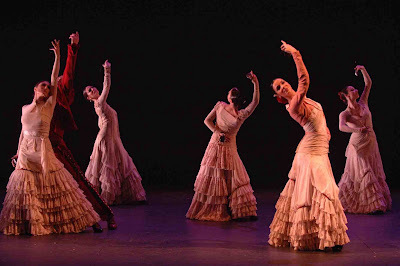 The Ballet Nacional de España are performing a triple bill this coming week in London, and despite their company name & the fact that the company is made up in the same way as a ballet company, you can see from the stunning photographs that this show is not ballet in the traditional sense. 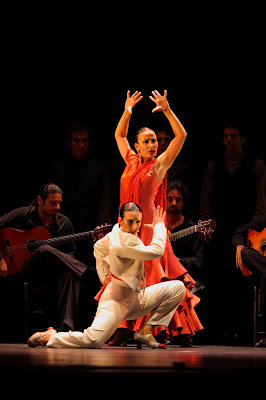 Nevertheless, I have seen authentic Spanish Flamenco shows in the past which have been stunning in atmosphere and visual imagery, and I think this will also be a show worth catching if you can. What's more, some of the performances of Romance de Luna will be danced by Royal Ballet Principal dancer Tamara Rojo - who began her ballet training in Spain. It will be very interesting to see her take on a traditional Spanish style in a Spanish company, here in London. During its 30 years, Ballet Nacional de España has performed in some of the most renowned theatres in the world and received some of the highest accolades including the Medalla de Oro al Mérito en las Bellas Artes, awarded to director José Antonio in 2005 by the Spanish Ministry of Culture. For their performances at the London Coliseum, the company will perform two of their best loved works Dualia and La Leyenda with an additional piece, Romance de Luna, starring Royal Ballet principal Tamara Rojo to be performed on 27 April, 1 May at 8pm and 2 May at 4pm. by Ballet Nacional de España. “Our intention with Dualia was to deal with Spanish dance and breath in the youth and freshness of this generation with such a rich repertoire, reflecting ourselves in the colours of Sorolla’s paintings, seeking the complicity of pair dancing, interpreting the sensuality of looks, caresses, kisses, reminding ourselves of the great dancers our country has produced, to try to portray our meaning and feeling through the rasping of the castanets. Thank you José Antonio, we hold your air within, this one is for you, maestro”. Carlos Rodríguez and Ángel Rojas. Elena Algado, Esther Jurado, Aloña Alonso, Tamara López, Jéssica de Diego, Maribel Alonso, Sara Calero, Carmen Coy, Lola Maeso, Yumi Saeki, Mª José Ramón. Sergio García, José M. Benítez, José M. Buzón, Eduardo Martínez, Isaac Tovar, Jaime Cava, Francisco J. Caraballo, Antonio Correderas, Ángel Lara, Álvaro Marbán, Alfredo Mérida. Sergio García, José M. Benítez, José M. Buzón, Eduardo Martínez, Isaac Tovar, Jaime Cava, Francisco J. Caraballo, Antonio Correderas, Raúl González, Álvaro Marbán, Alfredo Mérida,. Sergio García, José M. Benítez, José M. Buzón, Eduardo Martínez, Isaac Tovar, Jaime Cava, Francisco J. Caraballo, Antonio Correderas, Cristian García, Álvaro Marbán, Alfredo Mérida,. Those who like José Antonio knew her personally outside the clamour of the stage, however, can also attest to the fragility and humanity of this high-strung woman who was barely five feet tall. La Leyenda (“The Legend”) springs from these memories in a modest personal tribute, a piece created by José Antonio with affection and admiration. The proposal harbours no biographic or mimetic intention – Carmen was so utterly unique that any attempt at imitation would be futile -, but simply designs to portray, in images, an allegory of certain moments of her life and art, her strength and frailty, her grandeur and solitude, a dichotomy to which she and only she could be the antithesis. 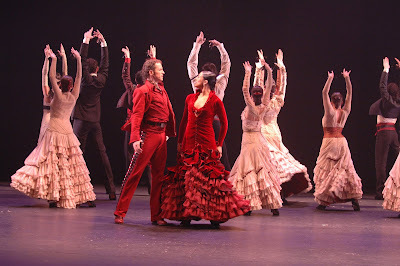 In this awareness, the choreographer has had to resort to duality, gemination, to splitting the woman into two personalities, both opposite and complementary: Carmen, the woman in flesh and blood and Carmen, the immortal artist who ventured from Barcelona’s “tablaos” to the fame of the American stage; only to suddenly and unexpectedly depart, leaving behind the afterglow of her endless train for us to embrace, forever. Rosalía Gómez. Guitarists; Diego Losada, Enrique Bermúdez, Jonathan Bermúdez. Please note that the company reserves the right to make changes to the cast. 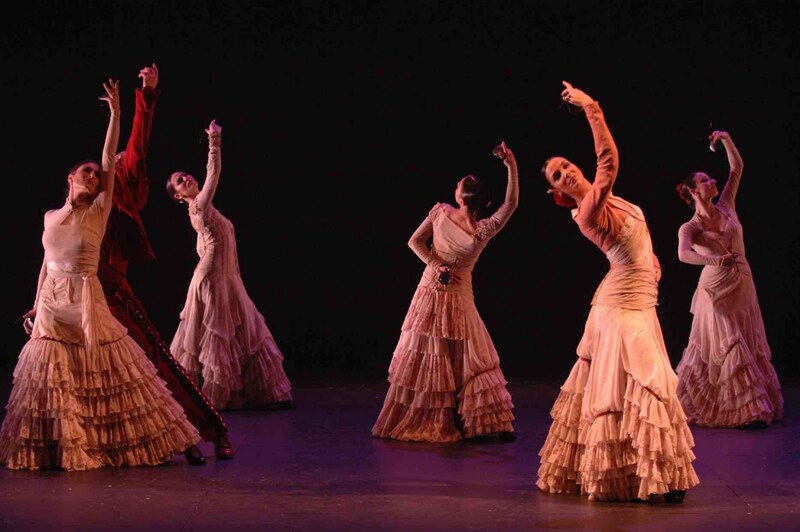 Today, the Ballet Nacional de España (BNE) is facing a new creative period, with various projects and will take advantage of the opportunity to spread, preserve, and promote the extensive heritage of their already-historic repertoire under the direction of José Antonio, commissioned by the Ministry of Culture in 2004, being his second time as Director of the Ballet. Founded by the Theatre and Entertainment General Direction of the Spanish Ministry of Culture in 1978, with the name of Ballet Nacional Español and with Antonio Gades as its first Artistic Director (1978-1980), the BNE has been directed by Antonio (Ruiz Soler) (1980-1983), María de Ávila (1983-1986), José Antonio (1986-1992), Aurora Pons, Nana Lorca y Victoria Eugenia (1993-1997), Aída Gómez (1998-2001) y Elvira Andrés (2001-2004). The BNE is, among the projects of the National Institute for the Performing and Scenic Arts, one of the most known in the world, as ambassador of the Spanish culture. 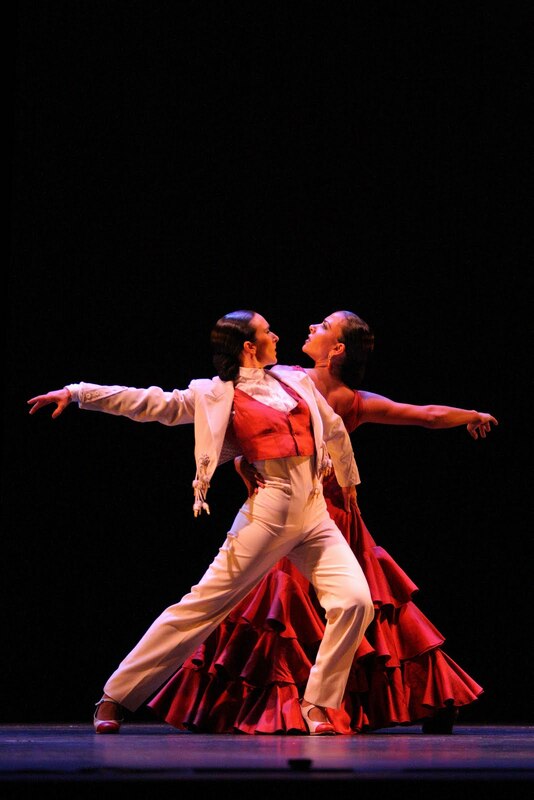 The Ballet has evolved in accordance with the new times and has known how to preserve its interest in all styles of Spanish dance, performing choreographies such as those of Escuela Bolera, flamenco and stylized Spanish dance. On the other hand, it has combined tradition and modernity, not forgeting main aspects as training and performing new projects. During its 30 years, it has performed, in the most renowned theatres in the world, emblematic works as José Granero's “Medea”, Mariema's “Danza y Tronío”, Alberto Lorca's “Ritmos”, José Antonio's “Fandango de Soler”, Antonio's and José Antonio's versions of “El Sombrero de Tres Picos”, Pilar López's “El Concierto de Aranjuez”, and Antonio Gades's “Bodas de Sangre” and “Fuenteovejuna”. Dualia was choreographed by two of flamenco’s hottest stars Rojas and Rodriguez, and explores the sensuality of looks and caresses through movement and music. La Leyenda (The Legend) was choreographed by the company’s artistic director José Antonio as a tribute to the famous flamenco star Carmen Amaya who died in 1963. The piece portrays images from her life – from the slums of Barcelona to the glamour of performing on the American stage in the 30s and 40s. Tamara Rojo won the 2010 Olivier Award for Best New Dance Production with choreographer Kim Bandstrup for a collaboration at the Royal Opera House called Goldberg: The Brandstrup Rojo Project. The Spanish Prima Ballerina began her training in Madrid and joined The Royal Ballet as a Principal in September 2000. Very interesting. Thanks for all the info. Anne - you are very welcome, thank you ! My friend saw the Ballet Nacional de Espana at the Coliseum and was absolutely bowled over by their performance. I wasn't able to go along with her and I'm now very sorry I missed the event. Do you know when they will next be performing in London? Anon - having just visited, it's unlikely they will be back any time soon. As soon as I have news, I will post it here. Thank you for commenting !